Scientists from the Catalan Institute of Nanotechnology, ICREA, the Universitat Autonoma de Barcelona, and collaborators have discovered a new method to write magnetic data. It eliminates the need for cumbersome magnetic fields and provides extremely simple and reversible writing of memory elements by injecting an electric current parallel to the plane of a magnetic bit. 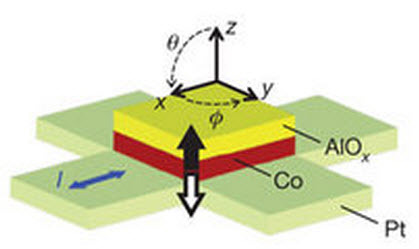 The researchers said that the key to this effect lies in engineering asymmetric interfaces at the top and bottom of the magnetic layer, which induces an electric field across the material, in this case a cobalt (Co) film less than one nanometer thick sandwiched between platinum and aluminum oxide. Due to subtle relativistic effects, electrons traversing the Co layer effectively see the material’s electric field as a magnetic field, which in turn twists their magnetization. Depending on the intensity of the current and the direction of the magnetization, an effective magnetic field can be induced intrinsic to the material that is strong enough to reverse the magnetization. The research team showed that this method works reliably at room temperature using current pulses that last less than 10 ns in magnetic bits as small as 200 x 200 square nanometers, while further miniaturization and faster switching appear easily within reach. This work has interesting applications for the magnetic recording industry, such as magnetic random access memory (MRAM) that would allow a computer to instantly power up and save energy.